The great state of N.C. is divided into three distinctive regions. The Appalachian Mountains rise in the western part of the state, the Coastal Plains lie to the east and the Piedmont is right smack in the middle. The Greater Raleigh area lies almost in the exact center of that sandwiched Piedmont region. Historically, N.C. was once a state of small-time farmers but has grown over the decades to embrace a diverse economy strengthened by agriculture, banking, manufacturing, technology and research. These industries have gathered together people from a plethora of backgrounds, ethnicities and cultures, thus creating a rich and unique local culture. PineCone, the code name for Piedmont Council of Traditional Music, is a nonprofit organization based out of Raleigh that is passionate about Piedmont N.C.’s traditional art forms. PineCone embraces a mission to celebrate those art forms by preserving, presenting and promoting traditional grassroots music, dance and other folk-performance arts. From hosting concerts to jam sessions, to music camps and workshops and their very own radio show on Sunday evenings on WQDR, Pinecone aims to make traditional music interesting and accessible to everyone. 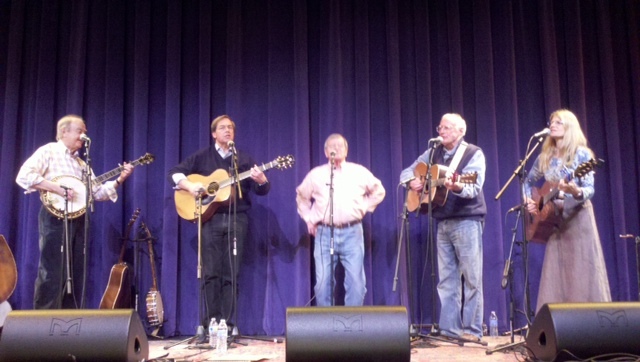 Last weekend, despite threatening icy conditions, PineCone hosted a benefit concert at Raleigh Little Theater. The headlining act was Bloomsbury, a congregation of experienced local musicians who first banded together in 1970 and have been creating harmonies together for the past 43 years. Bloomsbury is named after a park and well-known landmark that once existed in Raleigh. Wade Smith, a founding Bloomsbury band member says that the band plays the gamut of traditional music styles from our area, mainly blues, rock ‘n roll, folk, bluegrass, and gospel. Each band member plays at least three instruments – the banjo, guitar and fiddle – as their particular music style requires that you not just stick to one instrument. Smith says that the band was enthusiastic to partner with PineCone for the first time, as the organization’s mission parallels exactly what stirs Bloomsbury’s deepest passion -- bringing music to everyone and bringing people together to laugh and enjoy their down-home tunes. As well as bringing in beloved local acts, PineCone also brings big-name performers to the area. Past performances include Tift Merrit, Doc Watson, Allen Toussaint, Mandolin Orange, Steve Martin, Emmylou Harris, Bela Fleck and The Lumineers. On Feb. 15, Chatham County Line, a bluegrass-pickin’ foursome with roots in Raleigh and renowned nationally, will be performing with Virginia duo The Honey Dewdrops at Fletcher Opera Theater. On Mar. 1, The Gibson Brothers, who were named International Bluegrass Music Association’s 2012 Entertainer of the Year, will also play at Fletcher. N.C. has a rich bluegrass music history and her capital has served as a central location of that music scene since its inception. Raleigh’s music history is so rich that the Capitol City has been chosen to host the International Bluegrass Music Association’s (IBMA) World of Bluegrass events over the next three years. The World of Bluegrass programs will have all of Raleigh pluckin’ and pickin’ beginning in Sept. The World of Bluegrass includes a business conference, the IBMA Awards Show and a music festival. “Wide Open Bluegrass” will take place Sept. 24-28 this year. PineCone is working hard on through a local organizing committee to plan a city-wide extravaganza of music and will welcome dozens of bands to venues all over town. Check out PineCone’s performance schedule and pick your event to get a much needed dose of good ol’ N.C. music.